I talk a lot about authenticity on Cubicles & Curls. In fact, I'd say the mission of bringing our authentic selves out in all aspect of life is the reason I started this blog. 2017 has proven itself to be the year of being authentically and unapologetically black. 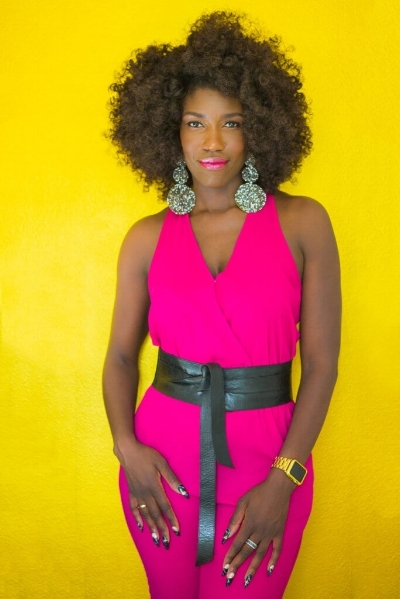 In the midst of this carefree black girl movement, I began to notice one Bozoma Saint John (b.k.a Boz, a.k.a Badass Boz if you recognize real), the Chief Branding Officer at Uber and former Head of Global Consumer Marketing at Apple Music & iTunes. Boz has already been making waves in the branding world as a creative genius, but she seemingly appeared out of nowhere and made her public debut at Apple's Worldwide Developers Conference in 2016. Making her stage entrance to the Rapper's Delight and commanding the room of mostly white men to "make their bodies rock" and "rap to the beat", I truly felt that I was staring at a unicorn. Beautiful. Bold. Black and a BOSS! My first thought was "we can do that?". We as black women? 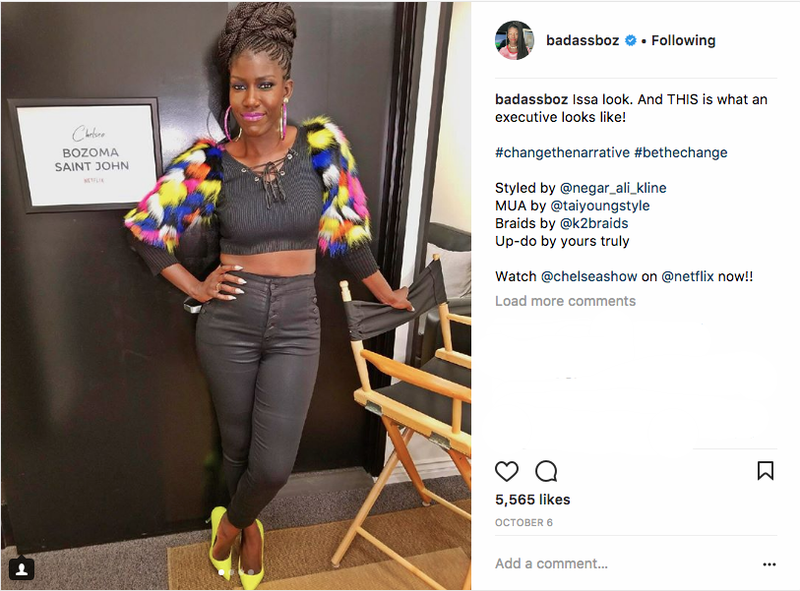 We can be blackity black, wear crop tops to speak at Forbes, bright colors with flamboyant ruffled sleeves AND run things at major corporations? Say no more. Badass Boz, quickly jumped to the top of my list of black girl role models as someone who is killing it and being 100% true to herself while doing so. It was then that I realized my life/career goal was to be so good at what I do, that I could be my full unapologetic self at all times without much a care. As I expressed this soft goal to my career coach, she checked me and let me know that I don't have to wait to start being unapologetically me. So I started to think of ways I could be more like Boz every day. From as early as high school, whenever I had my headphones in and someone outside of the diaspora asked me what I was listening to, I felt compelled to lie. My go-tos were either whatever top 40 song came to mind or jazz (REACH!). I didn't want to deal with teaching my co-workers who 21 Savage is and I didn't want to be stereotypical listening only to rap, even though these same coworkers were also stereotypical in their mainstream tastes. However, in 2017, the year where I decided that if someone thought I was being a stereotype it was a negative reflection on them and not me, I proudly own blasting the Get Turnt & Rap Caviar playlist in my headphones as I prep for client calls. I take the time to explain who the Migos are, why they are essential to the culture, and make song recommendations. I feel better and bolder in owning my tastes, declaring Black-ish > Modern Family, and not feeling pressure to assimilate beyond self-recognition. Your contribution to the diversity of your company doesn't come from being just a brown face in the company newsletter. You have lived a different life than many of your peers and not bringing that perspective to the table is doing yourself and your company a disservice. Not only have I been able to bring the kind of cultural awareness that could have prevented Pepsi from being the joke of the year, but I also am able to generate ideas from the perspective of a young, socially aware, millennial engrossed in social media and knowledgeable about how people engage with marketing and with tech. My blackness leads me to be able to connect, understand, and empathize with a variety of demographics outside of my own because I've always had to navigate different environments. While you're in no way obligated to educate anyone, especially not those who try to make you defend your culture or background, recognize that your blackness can be a value-add at work beyond connecting with an "urban demographic". I didn't need to read Lean In to learn to take a seat at the table. Even as a green and inexperienced intern, I knew there was value in my voice and that when I finally got my foot in the door, I would have more feet lined up and ready to follow me. When my former internship was looking for a replacement for the next summer, I helped connect my mentee. When I started my first job, I referred all my people to fill the openings. I find any and every opportunity I can to mentor those who look like me, to speak for those who don't have a seat at the table, and to make sure that I advocate for others to get the same or better opportunities that I've had. I personally believe giving back to those who came before and are coming after us while we're still climbing in our career is essential for building a strong tribe and making sure rising tides float all boats. When it's time for decisions to be made, you can be confident in knowing that you not only have a seat at your table, but your tribe has seats at different tables that can help propel you to where you want to be. Your authentic self might not necessarily look like Boz's but your voice should be loud and present throughout your career. When we shy away, we give the impression that we're not interested in the work or don't have much to contribute. In the next few months, challenge yourself to show up to work with more of your personality, character, passions, and beliefs on display. Embrace the questions when they are well-meaning. Don't explain yourself to anyone who doesn't respect your authenticity. They don't deserve it. Empower your fellow black girls to speak up and speak for them when they are silenced. How have you brought or plan to bring more of your authentic self to work this year? Share below in the comments!